Its many years since I went to the Frick Museum which used to be the private fifth avenue mansion and art collection of Henry Clay Frick. The last time I was there (I'm guessing the year 2000) what impressed me most were the Vermeers. They have three extraordinary Vermeers in the Frick: Girl Interrupted At Her Music, Mistress and Maid and Officer and Laughing Girl. I'm not going to reproduce them here because nothing online remotely does them justice. If you have a big resolution screen that displays a lot of colour maybe try looking at this one. When I visited the Frick last Sunday (the pay what you want day) I spent quite a bit of time in front of the Vermeers but I also had another agenda. 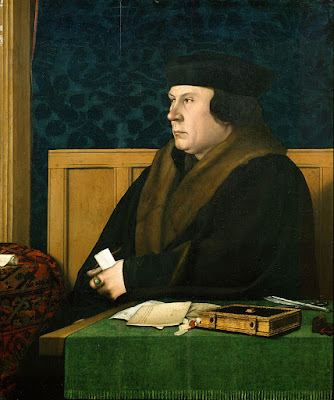 Ever since reading Wolf Hall and Bring Up The Bodies I've been very keen to get to the Frick to look at the two paintings of Sir Thomas More and Thomas Cromwell that were painted by Hans Holbein the Younger. The Frick displays them rather cleverly facing one another on either side of a fireplace. Seeing these two adversaries from the books (and obviously real life and The Man For All Seasons etc.) is quite an unnerving experience. The two men in question actually sat for Hans Holbein, for hours, while he painted these pictures. It sends a chill down the spine actually. And you can look from one man to another and back again. More is completely convincing as an intellectual, a dreamer, a thinker, someone not quite of this world. And Cromwell, yes, you can well believe that he is a Putney bruiser or as Hilary Mantel says: His speech is low and rapid, his manner assured; he is at home in a courtroom or a waterfront, bishop’s palace or inn yard. He can draft a contract, train a falcon, draw a map, stop a street fight, furnish a house and fix a jury. He will quote you a nice point in the old authors, from Plato to Plautus and back again. He knows new poetry, and can say it in Italian. He works all hours, first up and late to bed.